It’s about time I actually made something new, photographed it, and listed it at the Marketplace!! This creative block thing is for the birds. It’s so bad, that when I managed to actually finish something, I fought with 3 different Second Life Viewers to photograph it, wrestled with GIMP templates I haven’t touched in months, and repeatedly wondered “where the hell did I stash(the photos, my templates, my “patriotic” textures, my “builder’s skybox?”). It’s horrid! It’s bright! Feel free to tone it down. It’s copy, modify, but no transfer. Thanks to a customer inquiry, I got motivated to make something new in time for the US Independence Day holiday (which is Wednesday, a particularly wimpy day for a holiday). Owing to the weird way the textures come into view as the camera angle changes, the colors tend to shift from one side all red to one side all blue as you face the wearer. It was totally accidental, but I’ll call it “chameleonic” and not a bug, but a feature. Now that that little blockage has been blown from the chubes, I’m kind of getting interested in making or purchasing better flower sculpts, because I have many, many pictures of Hawaiian flowers and leaves to draw from for textures. It’s about time I got back to my virtual Hawaiian roots and tried a little traditional lei-making (since I know just a little bit about the real art of leimaking, it’ll be an enjoyable learning process). 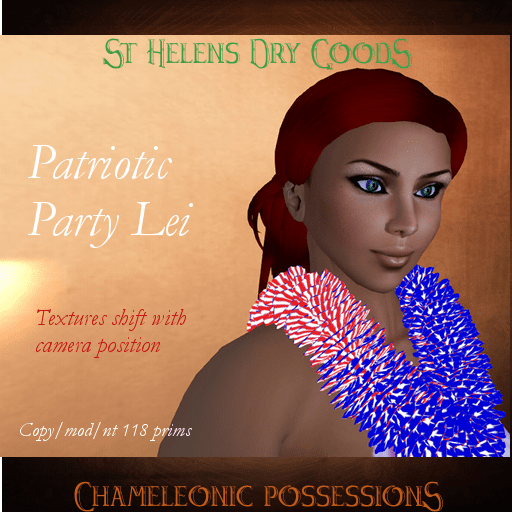 Summertime is party time, and luau time too – wear this patriotic lei or give it as a gift to friends. Colors appear to shift as the camera angle changes from more blue stars to more red strips. It’s certainly eye-catching… even a little garish! But the Fourth of July is all about the big bang boom, right? It’s like wearing bunting around your neck!